After driving through the desert from Alice Springs via the Gary Junction Road, we decided to camp at Carawine Gorge. 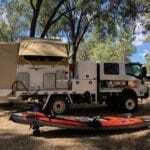 We weren’t expecting much, after all we were in the arid Pilbara region of Western Australia. And we certainly hadn’t even considered kayaking Carawine Gorge. However, we discovered Carawine Gorge has a large permanent body of water in a magnificent setting. Ideal for kayaking. So we inflated our kayak and hit the water, eager to explore the gorge. 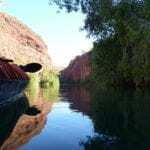 As we made our way up the long stretch of fresh water, we marvelled at the strangeness of kayaking in such an arid environment. 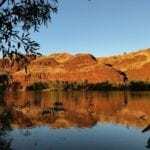 If you’ve ever been to the Pilbara, you’ll know it is extremely dry and harsh country. 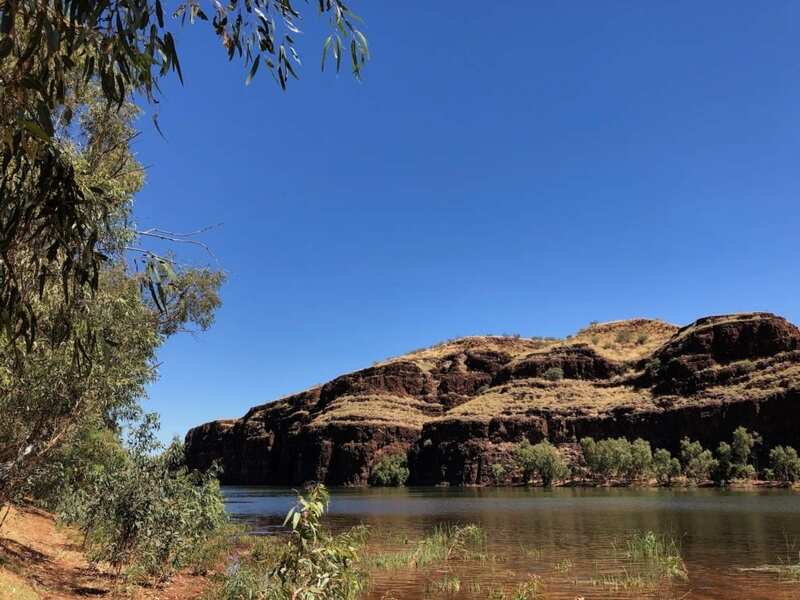 Carawine Gorge sits in the East Pilbara, just a stone’s throw from the massive Great Sandy Desert. The landscape here is littered with ancient hills, once mountain ranges now worn down to rocky hills. Rock dominates… in the hills, on the plains, pretty well everywhere you look. We certainly didn’t expect to discover this, on the edge of the desert. As a result, vegetation is sparse and daytime temperatures can be extreme. Yet there we were, gently kayaking along a wide body of water. It was quite surreal. The Oakover River has sliced a path through the Ripon Hills, forming vertical gorge walls of rock. The cliff walls almost look like they were built from blocks, stacked carefully on top of one another. The gorge walls look like they’ve been meticulously built from blocks. The best part of kayaking is exploring those places you can see from the shore, wondering what’s up that spur or along that creek. We found a shallow spur which was quite protected by a gorge wall. Along the base, all sorts of vegetation was thriving. 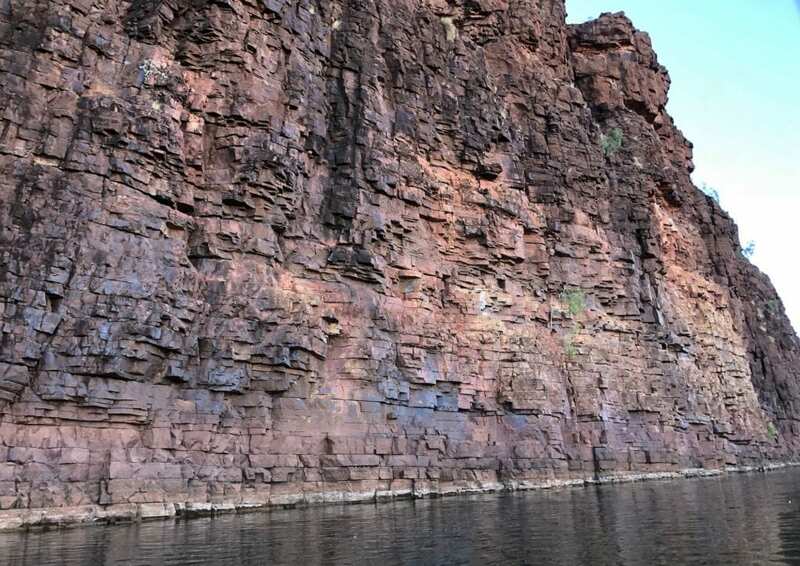 In stark contrast, the other side was exposed and rocky, covered in spinifex and red rock. In the shadier areas, vegetation thrives. This spur was shallow and we had to keep our eyes peeled for snags and sandbanks. It ended in a grove of tall reeds which provided the perfect habitat for all sorts of waterbirds. Western Australia is often tagged as “Windy Always” and this is pretty well spot on. After exploring along the main gorge wall late one afternoon, we decided to explore further the following morning. With a gentle breeze blowing as we launched, it was only a matter of minutes before the wind picked up and we were paddling into a strong headwind. So we battled on against the wind, deciding we’d have an easy trip back. 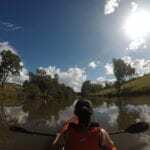 We paddled a couple of kilometres upstream to where the billabong petered out. No sooner had we turned around to go back than the wind switched around and hammered us again all the way back! Luck just wasn’t on our side. Despite the wind, our morning kayak was well worth the effort. Wind aside, the scenery was worth the effort. With big rains earlier in the year, we could see where the flood through here would have been several metres above our head. And the waterbirds flock to Carawine Gorge, everything from ducks through to pelicans and the occasional jabiru. 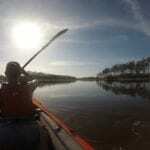 Kayaking Carawine Gorge is an unforgettable experience. 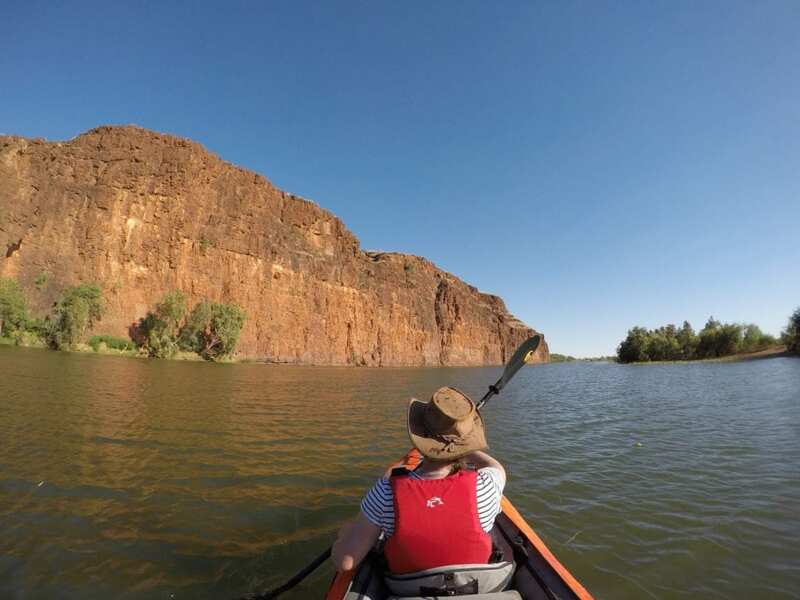 After all, how often can you say you’ve kayaked in the Pilbara! The contrast between the cool water and the harsh surroundings make this a special place, a place we’ll remember for a long time. 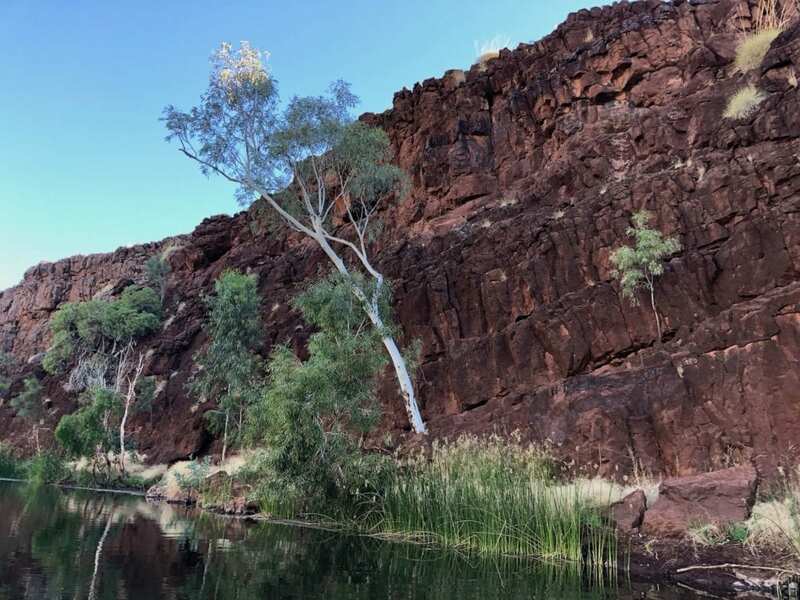 Carawine Gorge is on Nyamal Country. or go here for your very own personalised recommendation. …and remember to quote this Coupon Code for a 5% discount! NOTE: We purchased the Cruising In Comfort package at retail price. This article does contain affiliate links. (That said, our reviews are always honest and authentic – we tell it how it is). For a review on our Advanced Elements Inflatable Kayak, go here.